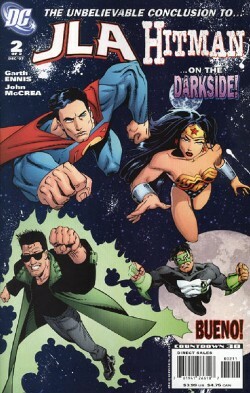 "On the Darkside - Part Two"
Clark Kent continues his untold story of Tommy Monaghan and the Justice League. After discovering the loss of their abilities the League watches as the NASA crew slowly makes their way across the lunar surface. Monaghan once again raises the issue that Superman is still trapped outside without his powers but Batman interrupts him, telling him that there are few people more capable of handling such a problem. Attempts at communicating with the crew fail and when Tommy tries to join the conversation Batman quickly cuts him off and informs him that once the whole thing is over he is going to jail. The crew enters the Watchtower as the League and Monaghan ready themselves for whatever may come their way. After the crew use the elevator to get to their position Batman demands that they show themselves and the League is horrified to discover that alien parasites have attached to the faces of the crew members. As the other possessed members begin to unload the parasites Monaghan opens fire. Batman quickly shouts for him to stop and reminds Tommy that those are people. The crew members seemingly manifest the abilities that the Justice League lost and suddenly it is a full on battle. Batman is taken out by someone using what appear to be Green Lanterns' powers and when GL and Flash go to help him they discover one of the parasites attached to his face. Using the weapons in Batman's utility belt they distract the aliens and escape in an elevator. The remaining heroes retreat to the Watchtower's lowest level, which is under Aquaman's tank, and quickly discover that if they kill the parasite that Batman will die too. A debate about whether or not to use torture tactics goes on between Flash and Green Lantern before Tommy takes the chance to shoot the parasite. As it begs for mercy Wonder Woman takes charge of the situation. She discovers that the aliens are a subspecies of the ones that invaded during the Bloodlines incident but more intelligent. Their possession causes a brief coma state before rewiring the host DNA and triggers a metahuman power. They aliens didn't steal the Leagues' power but instead developed a power to block their ability to use them. Their plan was to gain control of the League and use the teleporters on the Watchtower to travel to the Earth to assume the task of genocide while a breeding population would be established on the moon. Wonder Woman tells GL and Flash that she and Tommy will return to the control room where they will try to summon assistance and call of the attack that the President has undoubtedly ordered. When GL asks why just the two of them Wonder Woman explains that they are trained warriors and without their powers he and Flash will be a hindrance. Diana and Tommy begin the arduous task of climbing to the level. Soon after they are attacked by a group of the parasites and Tommy is forced to go alone as Wonder Woman fights back. When Tommy reaches the top of the ladder he is faced with a possessed Superman. The controlled Man of Steel attacks him, but eventually Tommy is able to help Superman break free. The battle leaves Superman drained and Tommy once again went off on his own. He charges into the control room and takes down the aliens, though the fight is far from easy. Soon the League members have their powers back and are able to call off the attack that the President had ordered. After the clean up Batman finally takes Tommy into custody, but his arrest is short lived since the cops the Dark Knight leaves Monaghan with owed him a favor. Clark ends his story by explaining why Superman and the League worked with Monaghan. He suggests that Tommy's story might just be one worth telling. Before Kirby leaves he tells Clark that despite all of the superheroes being something of a joke in Noonan's and Monaghan would agree, except for Superman, who was always ok by him. Later Superman flies to the Watchtower and visits his one memorial to Monaghan, the section of bathroom where the hitman had written, "Tommy Was Here." Story - 5: This is quite possibly one of the best comic books I have read all year. I really didn't know what to expect with this mini-series. In my last review I discussed the problems I faced with going into the story and how much I enjoyed it despite knowing next to nothing about Hitman as a character. The first chapter was mostly set-up and exposition, but done in such a smooth and entertaining way that I really didn't see it during my first pass on the book. I didn't know that Garth Ennis was going to use the second chapter to give not only an explanation on how a Hitman/JLA crossover works but break down the basic differences between the characters. And he wrote Superman so well it nearly gave me chills, but I'll get to that in a minute. For years now there has been a debate amongst comic fans; should heroes kill? And if a hero kills does that still make him a hero? Back in 1988 when John Byrne had Superman execute the Kryptonian villains from the pocket universe it caused a controversy that lasts to this day. It wasn't in character, many fans argued. Superman wouldn't do that. The explanation that Superman killed to discover that killing is wrong (I am over simplifying it a bit, I know) did little to placate this vocal section of the Superman fan community. In fact other creators disagreed with what happened. Outside of telling a great story and making the Bloodlines concept something I didn't want to laugh out loud at Ennis laid out exactly what separates the super-heroes of the League and characters like Tommy Monaghan and what makes them both equally valid. Ennis, through Clark Kent, explains all of the things that Superman, Batman, Wonder Woman, etc. would have done and why Tommy did what he did. He used Truman's decision to drop the bombs on Hiroshima and Nagasaki to illustrate that sometimes regular folk, and despite his powers Tommy was still regular folk, have to make hard decisions that those of his or her time and history may judge them harshly for. It's easy to play armchair general or super-hero and say this should have happened or that should have happened, but Tommy was put in an impossible situation and did what he had to do. And frankly I can't blame him. It's why I don't blame Superman (on a purely getting too much into it level) for killing the Kryptonian villains. He did what he had to do after weighing the moral implications against the possibility that those three Phantom Zone villains would get loose and destroy his world. They were more powerful than him. In all likelihood it might have been nearly impossible to stop them. So Superman executed them, just as Tommy executed the NASA crew to destroy the parasites and save the world from a group of individuals that, in all likelihood, would have been nearly impossible to stop. They both saved the day, but not in the way we probably would have wanted them to, just as Truman saved the lives of thousands of Marines by using the atomic bomb and avoiding an invasion. I don't know if Ennis was thinking about all of this when he wrote this issue, but I was. The other thing Ennis did was illustrate how even a hard edged character could have respect for Superman. I've talked to probably thousands of comic fans in my life. I have seen those that loved Superman and those that hated him. The third group is those that respected him. Even guys who were into Punisher and Wolverine and all of the "dark" characters of the late eighties and early nineties could still dig Superman at least for what he represented. Those fans now have a comic book personification in the form of Tommy Monaghan. Lastly, I loved how Ennis played Superman in this story. He was the hero, but even heroes have bad days and while it is always disconcerting to see Superman at his lowest I think every once in awhile you have to just to show that this guy is like us in many ways. I am firmly in the camp that believes that, on some level, I need to relate to Superman. If I see that he has his darker moments and bad days but still gets up and fights the good fight than I can find him even more inspiring. Ennis wrote that Superman. One that even after knowing what Tommy did and who he was would still stand up for him. I loved the monument on the moon. It made a joke from the first issue into a touching final scene in the second. This was a very good story. I have to rank it as one of the best JLA stories I've ever read. Art - 5: McCrea hit every beat perfectly. There was a horrific nature to the Bloodlines aliens and not only did John make them look revolting he made the possessed crew members and super-heroes (especially) look rather frightening. As in the last issue McCrea does what any artist drawing a group of bright and shiny super-heroes in a style that isn't anywhere near bright and shiny should do; he makes the League look like they would in Hitman's world. I call this the Wrightson Effect, since Bernie Wrightson did the same thing when he had Batman guest-star in SWAMP THING. I really enjoyed the art in this book and need to start tracking down those back issues of HITMAN as soon as possible. I have my work cut out for me, though. I hear they are hard to find. Cover Art - 5: I love the smile on Tommy's face on this cover. Everyone else has this expression of grim resolve but Tommy has this smile on his face that says just how happy he is to be flying through space. I'm a bit confused at the "BUENO!" written in the corner, but I am sure that's an inside joke that I just don't get.